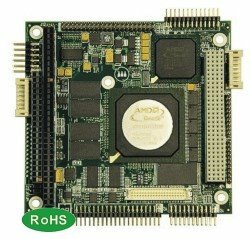 Amaro (Udine, Italy) – May 9th, 2006 – Eurotech announces today the release of a new RoHS compliant PC/104-Plus Single Board Computer (SBC) that specifically targets new high integration low power embedded designs. The new CPU-1433 replaces the old Geode GX1 based CPU-1432 with a new design with improved features and enhanced peripheral connectivity. 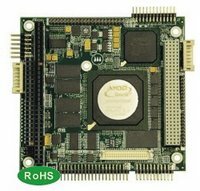 This advanced low power embedded +5V only CPU-module is based on the AMD™ Geode™ GX466 333MHz processor. Compatibility with commercial operating systems such as Windows CE® & XPE®, VxWorks®, Linux® and QNX® Operating systems is guaranteed. Integrated peripheral interfaces include: 2 USB 2.0 ports, TFT & CRT display interfaces, two serial ports, 10/100Mbit Ethernet, IDE, AC97 audio, AT-keyboard and PS/2-mouse. Onboard features include a Real Time Clock and Watch Dog timer and non-volatile Setup storage. A wide operating temperature range is achieved with a low power design that allows structural passive heat dissipation of the system. The CPU-1433 is available in standard (0ºC to +60ºC) and extended (-40°C to +85°C) temperature ranges. Onboard soldered 128MB of DDR memory improves system reliability in mobile installations where severe shock and vibration is common. The CPU-1433 mass storage can be implemented using a solid state Flash DOM (Disk On Module) extending the usability of this module in applications requiring secure data storage and improved storage reliability in harsh environmental conditions. Ideal applications for the CPU-1433 include mobile computer systems, real-time industrial control, process automation, digital video and multimedia data acquisition, in-vehicle electronics networking and wireless communications. The Eurotech Group recently strengthened its position in the global embedded-PC market and has extended its product range with a focus on standard system solutions. The Eurotech Group (www.eurotech.com) is a global family of leading edge technology companies covering the most important and active market areas across three continents. 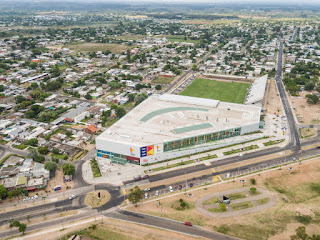 With operations in Europe, North America and Asia, the Group serves the industrial, transportation, defence, security, aerospace, utilities, and research markets. The Eurotech Group includes Eurotech in Italy, Finland and France (www.eurotech.it, www.eurotech.fi and www.eurotechfrance.fr), Parvus in USA (www.parvus.com), Arcom in UK & USA (www.arcom.com) as well as Neuricam (www.neuricam.com), Exadron (www.exadron.com), Ascensit (www.ascensit.com), and IPS (www.ipssistemi.it) in Italy.